I'll have video of this moment (close to it, anyway) up on MN Stories today, too. Paige, a Bethlehem-Center High School senior, at her mock funeral Friday held to warn students of the dangers of driving under the influence. 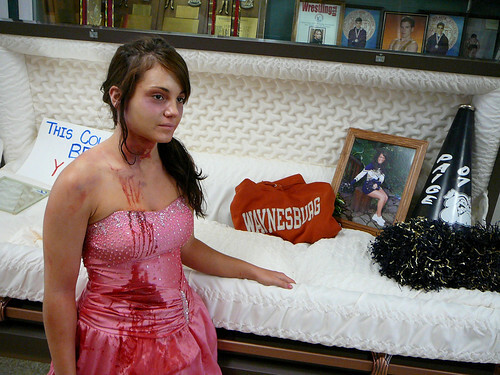 It has become common theatrics at schools in Southwestern Pennsylvania to create fake, bloody car-crash scenes prior to proms. The schools also bring in wreck vehicles, local police, firefighters and ambulance helicopters to add to the drama.